Fire Engine Capt. 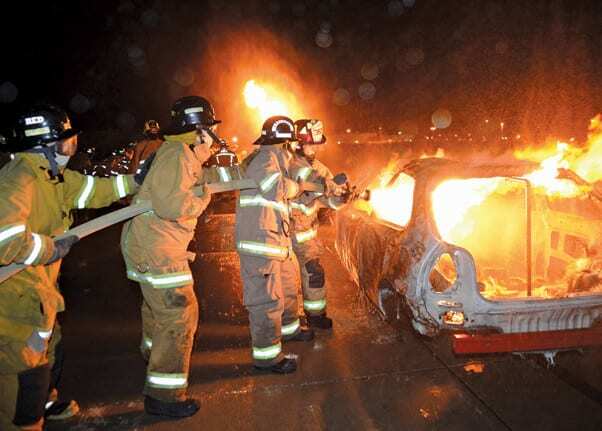 Jamie Williams (on nozzle), with Barstow Fire Department, teaches fire attack on a vehicle (control fire fueled by propane) to fire explorers participating in the 2015 Inland Empire Fire Explorer Academy. Fire explorers from the Inland Empire Fire Explorer Association graduated, Dec. 6, from an annual academy that has been held at the National Training Center and Fort Irwin the past 15 years. The 168 explorers completed the 24th IEFEA academy after conducting four days of training that included: structural fire control, firefighter safety and survival, and flammable liquids and gases fire control. The explorers, ages 14-21, came from 30 posts within Riverside and San Bernardino counties in Southern California (West Covina post 465 in Los Angeles County also participated). They received training from more than 90 advisors, who are firefighters from the participating posts. 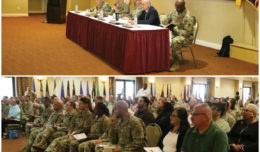 The academy takes place through a long-standing partnership with the Fort Irwin Fire Department of the Directorate of Emergency Services here. 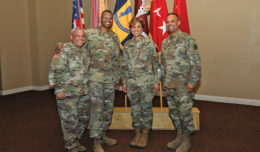 Hundreds of family members and friends attended the graduation ceremony, which included Fort Irwin United States Army Garrison Commander Col. Scott Taylor as the keynote speaker. He thanked the families for making the long trip to the event and praised the explorers for their perseverance in the training they received. 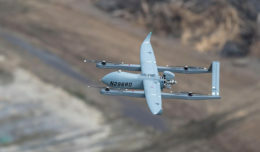 “I want to take a moment to thank you for your time that you’ve taken this week to sacrifice of yourself, to commit yourselves to a program proven to teach skills through hard work, to develop teamwork through cooperation and camaraderie, and to dedicate yourselves to learning a bit more about the core values of fire explorers,” Taylor said. Taylor explained the fire explorer core values are similar to the Army Values and provide a basis for future success. The colonel acknowledged the academy was arduous, but rewarding. “It was tough, it was demanding and through those challenges you’ve achieved something that is worthwhile, something that you’ll be able to look back upon with pride and hopefully say you had some fun and learned a few things,” Taylor said. Fire Explorer Capt. Efren Cuevas, with Explorer Post 620 in Hemet, Calif., completed his second academy and wants to pursue a career as a firefighter. The 17-year-old said the training was physically demanding, but he valued the experience for the realistic training that has helped him decide to pursue a profession in firefighting. He also expressed gaining more appreciation for the job that firefighters perform on a regular basis. The academy public information officer, Fire Explorer Marshall Spearman, has been a fire explorer for two and a half years and explained on a radio interview the first day of training that explorers benefit immensely from the program.